Amko Foods manufacture a range of Shredded Beef & Vegetable Suet for bakery, food manufacture and retail sectors. Gluten Free Suet range available. 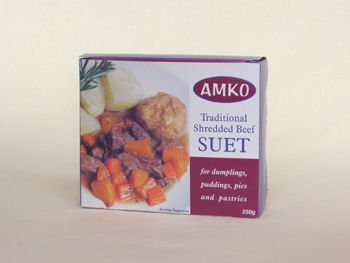 Amko is the 1st EU Approved Beef Suet processor in the UK. Dumpling Mix – Gold Award (1 star) at the Great Taste Awards 2012 (held by the Guild of Fine Foods) we manufacture a range of suet and dumpling mixes (using our Amko shredded beef suet – for caterers, manufacturers and wholesalers, and retail outlets. Copyright Amko Martindale Foods Ltd © 2019. All Rights Reserved.